Tachog Lhakhang Dzong is located on the way to Thimphu from Paro valley, and one must actually cross one of Druptho b Thangtong Gyalpo bridges to get to the Dzong. Drupthob Thangtong Gyalpo was the man who built the iron chain bridges in Bhutan in the late 1300s, and is said to have built 108 of these bridges around Tibet and Bhutan. Many of them are still in use today, showing how strong and durable the bridges are. The temple itself is private, but can still be entered by tourists. The Dzong is relatively small and has many fruit trees, orange and apple, around and inside of it. The people who take care of the Dzong also herd cattle, and can be seen caring for them as you continue your tour around the area. 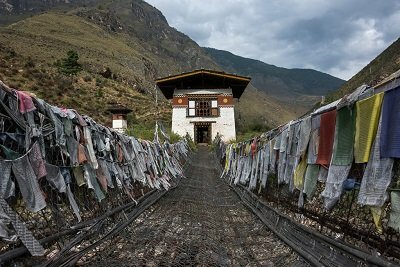 It was built in the early 15th century by the great master architect and yogi Thangtong Gyalpo(1385-1464), who also built Dungtse Lhakhang in Paro and many iron bridges throughout Bhutan and Tibet. Tachogang means ‘temple of the hill of the excellent horse’. 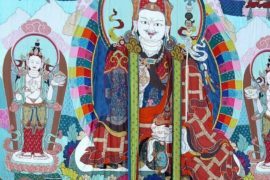 It is said that while Thangtong Gyalpo was meditating here, he had a vision of the spiritual horse Balaha-an emanation of Avalokiteshvara. He decided there upon to build a temple at this spot, in addition to one of his famous iron bridges later carried away by floods in 1969. A traditional style bridge with iron chains was restored in 2005. 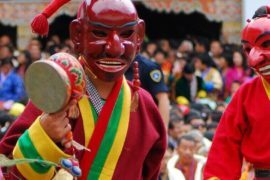 The temple is privately run by the descendants of Thangtong Gyalpo.